Ever since I made a very brief visit to Croatia in 2007 I've been fascinated with the country. I have never seen more crystalline waters than those around the pristine Croatian coastline, the clarity of the Adriatic there is unlike anywhere else. The air quality was exceptional too, not something you normally notice, yet I remember it distinctly. But my best memory is the food and wine I experienced on my visit which left me wanting more. I've been anxious to get back for a longer visit and a proper introduction to the food and wines ever since. Recently through the miracle of Twitter (and I do believe Twitter is a miracle as it has facilitated so many great connections) I got to chatting with Cliff Rames from @WinesofCroatia and @istriaficionado, and that chat led Cliff to set up a "twitterduction" with Frank Dietrich of @BlueDanubeWine an importer of Croatian wine in Palo Alto, California. Frank and I exchanged an few emails and I'm happy to announce that we will be working together to host a Wines of Croatia Tasting for local wine bloggers at my house later this month. It's going to be a fun event and the great folks at the Croatian Tourist Board are providing me with maps and wine background materials for the event. 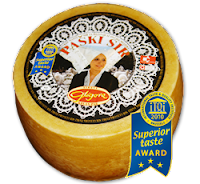 Plus they have very kindly offered to supply a traditional Croatian sheep cheese from the island of Pag called Paški sir for us to pair along with the wines. The cheese is available locally in St. Helena at Sunshine Foods and other cheese shops in the Bay Area including The Cheese Shop in Healdsburg. Click on the picture below for more information. Blue Danube Wine has a terrific website with excellent information and a great map of the wine regions of Croatia. I have no idea how to pronounce many of these wines and some of the names look like they may put your tongue in traction if you try. I'm not entirely sure which is the grape variety and which is the producer from looking at some of the labels, but I'm hoping that Frank will give us a little tutorial on how to read a Croatian wine label at the tasting. After exploring Frank's Blue Danube Wine site I decided I could not wait for the blogger tasting to try the wines so I went right out and bought a few bottles at my local wine shop. I found a Peljesac, a Graševina/Welschriesling and a Zlatan Plenković all priced under $20. I really was impressed with the 2007 Peljesac Red from Dingač. This wine had nice balance and was full and flavorful like a Zinfandal with slightly spicy tannins. I tried it with a fusilli pasta dish made with fennel and oyster mushrooms along with a side of marinated eggplant and it was a delicious complement to the food. The Zaltan Otok 2009 Zlatan Plenković white a blend of Pošip and Maraština grapes was quite full bodied and also paired well with eggplant and sausage pizza that I made with the leftover eggplant from the night before. My favorite label design was on the Enjingi 2009 Graševina and the wine was well constructed too. Loved the bright flavors of apple, apricot, and linden berry with a crisp mineral hit of granite. It's body compared to the Zlatan Plenković was delicate, more whisper than shout. I can't wait to learn more about these wines and other varietals at the blogger tasting with Frank and share the findings here. I'm hoping to visit Croatia again soon, possibly before or after the International Wine Tourism Conference in Italy, where I will be presenting. So stay tuned wine and wine tourism fans. There's a lot more to come from Croatia! Thanks for the iwinetc 2012 mention in Italy. Talks are in progress to have a Wines of Croatia Grand Tasting as part of the International Wine Tourism Conference "After Conf Prog" so fingers crossed. Marcy, they paired quite well at WBC11. I was excited to taste the Croatian wines and talked briefly in VA about the large Croatian and Slovenian (largest outside Slovenia, actually) populations in Cleveland. We've had a few conversations sine I got back with members of those communities about the wines we tasted. Would love to see a few of those Croatian beauties make there way into the wine shops in the area. Looking forward to reading about your findings! @Southern WIne Trails --I heard that the room 606 tasting was a highlight of WBC11! Hopefully you'll start to see more Croatian wines out your way soon. Melanie @TravelswithTwo-- Hey Melanie, thanks for stopping by here. Yes, a trip to Croatia to place the wines in context would be ideal indeed! In the meantime, stay tuned for a full report after the tasting. If you are in Napa Valley, go see Grgich Hills winery. Croatian style wines. Wines of Croatia Tasting: The Recap! I Can Almost Taste It! Croatian Wine is Near.